(CNS): If a proposed bill becomes legislation, all lawyers working in the Cayman Islands will be required to offer pro bono services to those in need of legal representation but who cannot afford an attorney, with an option of paying an annual fee instead. The draft Legal Aid and Pro Bono Legal Services Bill 2012, which deals with the contentious issue of how legal aid is funded and to ensure the public is given equal access to justice, has been released for public consultation. It proposes, for the first time, that all lawyers will be obligated to provide their services free of charge for 25 hours per year or make an annual contribution to the court of $2,500. The bill also introduces a legal aid director to manage the funding of the defence scheme, as well as requiring the lawyers to be available for legal aid work and pro bono services. With the legal aid budget hovering around $1.8 million per annum and a constant shortage of lawyers to take on the mounting number of criminal cases, government has been trying to find a solution to the problem of equality in justice. The latest draft bill introduces a legal obligation, which will see the country’s more than 500 lawyers forced to contribute to public justice, either through their skills or financially, and no longer relies on the goodwill of a small number of attorneys who have been willing to take on pro bono work. Although the profession and government had resisted legislating that lawyers work pro bono, this law now proposes to create a legal professional duty. Every attorney’s licence to practice in Cayman will be contingent on the demonstrated completion of their annual pro bono quota or payment of a fee which will be used to off-set legal aid costs. The only lawyers that the obligation will not apply to, if the legislation is passed, are those working for government. Currently, there are only around a dozen lawyers who are regularly available for legal aid work. These are mostly criminal attorneys who are paid a flat rate of $135 per hour from the legal aid fund, which is currently administered by the courts. Several of these lawyers already do many hours of pro bono work on top of the legal aid hours for which they bill, but the pool of attorneys doing so remains extremely small given the number of qualified lawyers working in the Cayman Islands and the mounting number of serious criminal cases that these attorneys are dealing with. . In this new draft bill it is proposed that all lawyers, regardless of their position, will now do some work for those in need of representation free of charge, alongside the criminal defence attorneys, who will continue to work for the legal aid system. There is also a provision for collective service for larger firms, whose attorneys can pool their pro bono hours. It is proposed that the legal aid funding and management will be handled by an appointed director and support staff in the Deputy Governor’s Office. According to the new bill, the director will establish a list and manage a roster of available attorneys for defence and introduce a duty counsel system for those remanded in custody at the police station and charged with a crime. It also sets out to cap the legal aid earnings of any individual attorney at $80,000 per year, except in certain circumstances. The director will also be responsible for preparing the annual legal aid budget. The proposed law sets out the criteria and qualifications for those applying legal aid and provides a way of having those provided with public money for their representation to contribute to that cost if they have the means to do so. Funding for legal aid continues to be a contentious issue but with the advent of the Bill of Rights in November, equitable access to justice is enshrined in law. With criminal cases mounting and little popular support for the growing costs of criminal defence, government has wrestled with the issue for several years. A controversial plan and an effort to cut the budget by the premier in 2009 by creating a legal aid clinic with its own lawyers under his ministry was abandoned when the proposal was criticised in a report as being more costly than the current system. The move also brought sharp criticism from the chief justice when the legal aid budget was taken from judicial administration, and legal aid lawyers encountered significant issues getting paid for the work they were doing. The uncertainty surrounding legal aid over the last few years has led to some defence attorneys abandoning, or reducing, their legal aid work, making a bad situation even worse. Government is now seeking comment on the proposed bill by 5pm on Friday 13 July. The draft bill can be viewed here or below. Comments should be forwarded to Director of the Law Reform Commission, Cheryl Neblett at: cheryl.neblett@gov.ky. Out of almost 20,000 work permit holders there are 2,591 professionals on work permits, which includes accountants, fund administrators, doctors, lawyers and teachers. its strange then that for some reason the lawfirms are the only ones being targetted by Government. A large number of the lawyers do not and cannot practise in court so it makes me wonder why such a tax would be levied on just lawyers. This seems to go hand in hand with the latest stats that shows we have 10% unemployment, yet Government is passing legislation to force the firms to hire the 6 that cannot find articles. Its clear that out of the number of persons working in the jurisdiction the professionals including the lawyers are a minority on permits. All of this targetting of firms smacks of someones personal vendetta. Given the low number of permits in an industry that is and always has supported the entire country and produced the most revenue for Cayman, isnt this a bit risky, to allow one persons vendetta against a big firm and politics to rule the Islands entire agenda? Three brothers all professionals went fishing one a Doctor, one a lawyer the other a Pastor. They were catching fish left and right but sharks were gathering around their boat but hey continued fishing and discussing the topics of their professions and what is in the news on the Island. The lawyer asked the Pastor if he had taken Nation Building money. The Pastor replied he had because the church needed a new roof and other repairs. The Doctor chimed in and said that taking government money for repairs to the church was a sin. The Pastor said that he was wrong and to show it to him in the good book. The lawyer said in other countries the church could be sued. The Pastor said thatwe are not in another country so that’s the end of it. Just when the Pastor was cutting a piece of conch he cut his hand. He washed it over the side of the boat and that really agitated the sharks. There were Hammerheads, tigers, white tips, black tips even sand shark were circling the boat. They were very concerned and decided to leave. The engine won’t start. They tried and tried but nothing happened. The lawyer said that he would swim ashore to get help he didn’t want his brother to bleed to death and the doctor could tend to the Pastor. The Doctor was concerned about all the sharks. The Lawyer said not to worry everything was under control. So he jumped into the water and all the sharks formed two lines from the boat to shore and the lawyer swam between them. The Pastor said “it’s a miracle”. The Doctor said no it’s professional courtesy. That is not satire. It is just a really old joke. Brilliant move, but we also need to weed out the 'wasters' those that take your legal aid case and do absolutely nothing for you. There are good lawyers in this country that are being tarnished by the lazy ones, or those that are looking to 'get rich quick'. These are the ones that make a mockery of the legal fraternity in this country, they should be disbarred in my opinion. However, if that's the route they going to take, then also ensure that persons whom genuinely need legal aid (as I did, as I am unemployed) don't have to go through what I was put through here's an example of such: my legal aid application was turned down twice by the Chief Justice, then when I finally fought like hell to get it approved it came with 'conditions' which meant my Lawyer could not come to court for mentions etc., it stated it was approved FOR TRIAL ONLY. I had to prepare the majority of my case (except for the points of law) for my legal aid attorney because of the restrictions placed on his certificate. Thankfully I got an EXCEPTIONAL LAWYER to represent me. Thankful I too had some knowledge (by asking 100 questions)of what to do to prepare for my trial, but not everyone else knows what to do. Do to the limitations placed on my legal aid certificate I had to attend court for mentions and have the Prosecutor and Magistrate ridicule me in the dock, and if I had my lawyer present they wouldn't have done so, because my lawyer was restricted to Trial only. So, if we are going to take a step in this direction, please weed out the undesirables making a mockery of this honourable fraternity and one way of doing this is to have a COMPLAINTS dept that actually deals with this, and responds to you in a timely manner. There should be genuine investigations conducted after receiving a set number of complaints, and disbar them! Also, when your Legal Aid Lawyer wins your case they should be paid more, because as it is it's not much, and is something like $175 per hour and SOME legal aid lawyers really fight for their clients genuinely and they should be compensated fairly for their efforts. However, there are others that simply DO NOT! I know I encountered a few whilst spending the last two years dealing with a very prejudicial system towards me. One legal aid lawyer told me in his office "you are lucky I am sitting here with you, most lawyers wouldn't take the time to deal with your case". Well, he was terminated by me immediately, because after having my case in his hands for four months, he hadn't even opened the binder much less read the particulars of the case. This is what our people have to deal with, and if they don't know their rights or that they can do something about it they end up being represented by a prejudicial lawyer whom couldn't care less what happens to your case as long as they get paid. XXXX It is these ones that tarnish the good lawyers!! Plus, this mention system the Courts have going on, I have never in my life witnessed more laziness by the Legal Dept staff. They put off more cases and that to me is simply a ploy to waste the Defendant's time and the Courts time or to aid a friend to make more money! I am not the only one, because after speaking to others with similar complaints about the system, and they too have to deal with this, and it's always our native Caymanians that have these complaints. May I be as bold as to mention the following: During my trial, in walks a Legal Aid Lawyer whom had an application in hand and his client was an expat, and from what I can gather was on a work permit, had stolen up to that point over $60K, but was later revealed it was over half a million, he was granted legal aid instantly, it took all of five minutes, no hesitation whatsoever by the court. But our native Caymanians, that are unemployed have to fight, fight, fight like warriors in our own country to get assistance. What is wrong with this picture? Respectable attorneys already provide pro bono representation to the indigent as part of their professional obligations. There is plenty of need for free legal advice beyond criminal defense. Only in Cayman would such a requirement be considered shocking. You are right that many attorneys already do pro bono work. The difference is that they naturally give legal advice and assistance within their field of expertise or experience. It is a foolish and dangerous law that seeks to compel lawyers to give advice in areas in which they are not competent. I doubt that you will find such a law in other democracies. The one size fits all approach is also fundamentally flawed because this impacts on both the newly qualified lawyers struggling to make ends meet (who are Caymanian) equally with senior partners in major firms whose incomes are vastly greater. The reality is that this is a tax which the government feels will enjoy public support because it is levied against a profession which many people love to hate (at least until they need a lawyer). It is fundamentally unfair unless a similar tax is levied against all professions and businesses and on the basis of ability to pay. For example, no business gets paid so much for doing so little as real estate agents where one can earn 4% of a multi-million dollar sale simply by introducing the buyer and seller, yet their trade and business licence fees are among the lowest. Why aren't they subject to this tax as well? Is it because the Premier owns a real estate ompany? Why not compel every doctor to give free medical care and every pharmacy to give free medicine to indigents? After all these are basic necessities. How about some free plumbing and electrical work? Why should the accountants escape? GREAT IDEA! !………At last dem come up with a useful idea. ….but the contribution is by far an inconsiderate proposed amount for a very experienced and well established lawyer – more in the range of KYD10,000 would be more appropriate..
KYD2, 500 would be more a appropriate amount for a newly qualified lawyer with less than three years experience, say. Its just a small price to enjoy d "milk n honey"………don't-cha think??? ………and such a great way of giving back to the communiity……don't-cha think? Why? Because leadership thinks they are intitled to it. I understand the short title of this Bill is "The Clifford Amendment". Mac you better be careful that the Chuckster don't enter the ring again for Round 2. Remember he don't have any PPM baggage/dead weight to hold him back this time !!! It's interesting to watch how most folks paint all lawyers with the same brush, as if the legal profession is a homogenous body of greedy rich folks who exploit the poor and downtrodden folks of this country to their collective and personal benefit. There is a vast divide between the typical sole local practitioner type business that has proliferated in recent years (usually as a result of disenfranchised young local attorneys being "persuaded" or rather, let's call it by its proper name – constructive dismissal – to leave the larger firms)XXXX. The typical sole practitioner is a born Caymanian who has to work hard to promote their business, does mostly domestic and court work, takes on pro bono work on a regular basis (after all they're usually the ones with friends and family here that need helping out with that kind of work) and yet have to pay the same fees as the big firms partners to practice law here! Where's the equity in that? In fact it gets worse. It turns out that there are HUNDREDS of "lawyers" working overseas for these big firms in their satellite offices in Hong Kong, Mauritius, etc. who have no license or permit to practice Cayman Law in any of those countries or without any qualification to practice Cayman Law issued by the Cayman jurisdiction. This unregulated outsourcing has been going on for years and has been aggressively promoted by the big firms, for their own profit, while they tell our numerous frustrated Cayman Islands Law School graduates that they don't have any work for them. And now since they have been caught out, after a veritable diaspora of young Caymanian lawyers from these firms and scores of unemployed (yes unemployed!) Law School graduates languishing, they have the temerity to demand that the government should immediately promulgate a new law which permits them to license this type of practice, thereby enshrining their immoral position and ensuring them enhanced profit, to the detriment of the Caymanian element of the legal profession and the Cayman profession as a whole. They say that if we don't do this, the Cayman Islands are doomed because of the disadvantage we'll have in the world market and the jurisdictional risk of allowing these folks to go on doing what they have been doing for years. Or put another way, they're saying, rather arrogantly, "we've practiced outside the ambit of the law for too long now, and so you have to license us to continue doing this, otherwise you're dooming the Cayman jurisdiction's reputation!" Talk about nerve! What is the relevance you ask? Well, it occurs to my simple Caymanian brain, that this is one of the ways that the big forms will effectively bribe the government into passing their practice into law, thereby sealing our fate. They will offer to paythe tax, after all most of their lawyers wouldn't sully their hands with such menial work! Truth is they wouldnt know how to represent anyone in court anyhow.The next thing you will see is an offer to pay higher work permit fees and the like, so that our desperate government will have a basis to sell their bill, since the scaremongering hasn't worked (as yet). So, remember that the next time you're bashing lawyers. They're the folks that you hate until you need them. And there's a good many out there right now who are struggling to pay their bills, just like lots of other folks who have to work for a living here, while others sit around gathering the profits gained, at least partly, from and at their loss. Here in the States, the Courts have recognized that the constitutional right to counsel is needed in order to protect the fundamental right to a fair trial. The Constitution guarantees a fair trial through the Due Process Clauses, but it defines the basic elements of a fair trial primarily through several provisions of the Sixth Amendment, including the Counsel Clause. That a person who happens to be a lawyer is present at trial alongside the accused, however, is not enough to satisfy the constitutional command. For that reason, the US Courts have recognized that "the right to counsel is the right to the EFFECTIVE assistance of counsel". The right to counsel plays a crucial role since access to counsel's skill and knowledge is NECESSARY to accord defendants the "ample opportunity to meet the case of the prosecution: to which they are entitled. Further down the road, the Cayman Islands Government might find challenges from defendents successfully claiming that their rights were violated regarding the right to effective assistance of counsel when Government interfered in certain ways with the ability of defendants being assigned skilled attorneys whom have practiced in their given area of need, not just that they were assigned counsel. Otherwise, under a flawed bill, more accused defendants will likely have their convictions overturned on appeal because of being assigned a structured finance lawyer to try a murder or narcotics case. Having said that, the $2,500 fee would realistically need to be at least $10,000 to have attorneys actually show up for the pro bono wheel selection, instead of just writing a check. Legal Aid budget dilemma solved. It's a shame that lawyers here in Cayman have to be threatened with a fine ('cause that's what it is) to do the right thing. Couldn't they have organised a scam ……, sorry, I mean scheme, amongst themselves before it got to this sorry stage? Doesn't reflect well on them as a body, and only serves to reinforce the public's negative perception of them as a bunch of no-good, money-grabbing, ambulance-chasing scoundrels, which, er, is utterly untrue, of course. Many lawyers here already do the right thing. We do pro bono work all the time although not necessarily as a part of some court scheme. Lawyers are the only persons presently supporting legal aid. How about you were taxed and do your part as well. I assume that this will apply to each attorney in the Legal Department and all other Civil Servants with a law degree. I have not seen the proposed law but it would be interesting to know who is considered to be a lawyer. It won't. It will apply to attorneys holding practising certificates. Government attorneys don't hold practising certificates and are specifically exempted. Of course it is drafted by the Government attorneys. Sorry everyone, Richard wrote this without my knowledge and used my digital signature. A lawyer defending a man accused of burglary tried this creative defense: "My client merely inserted his arm into the window and removed a few trifling articles. His arm is not himself, and I fail to see how you can punish the whole individual for an offence committed by his limb." "Well put," the judge replied. "Using your logic, I sentence the defendant's arm to one year's imprisonment. He can accompany it or not, as he chooses." The defendant smiled. With his lawyer's assistance he detached his artificial limb, laid it on the bench, and walked out. attorney who died after practicing law for 30 years. Which do you want?" "I'll take the lawyer's heart," said the patient. After a successful transplant, the doctor asked the patient why he had chosen the lawyer's heart. "It was easy," explained the patient, "I wanted a heart that hadn't been used." He must be stopped! If McKeeva gets away with this then he is likely to come after Civil Servants next and expect us to work 25 hours a year! Apparently something like this system works well in Jersey although they require the work to be done rather than offering a cop out of paying a fee, albeit that the firms recruit specialist criminal lawyers to do the work. These fees are too low and I hope the big firms don’t complain as the proposed change would make no difference to the lifestyles of fat cat equity partners. Before any of the lawyers complain they should disclose their earnings for the last few years, I bet they don’t want you to know how much they make. Who thinks this bill wont be going to court ? it is well accepted that most lawyers are the sharks of society and interested only in wealth building and satisfying their own egos this will not work. It is sad that whether you go to jail or not for a crime, largely depends on the lawyer you have, and not whether your truly guilty or innocent. A lawyer forced to work for free is unlikely to do his or her best in the interest of justice, therefore completely defeating the purpose of proper representation. That is only accepted by the ignorant. Truly educated people do not think in ludicrous generalisations. I can see that anonymous 10:55 is a lawyer or is very close to one. Which is it? I am a carpenter. Thank you for proving my point. Let the Bushit tax begin! With the expected results. How about politicians work for free … Like the old days? Can I get a thumbs up? Lawyers to work for free? This is the first thing since this present Government's inception that I agree with. I mean come on people, stop complaining. It's only 25 hours a YEAR NOT 25 HOURS A MONTH. If you want it simplified, its only 1 day & 1 hour, compared to the rest of the year that they will be charging $300-$500 (or more maybe) an hour. Just because lawyers are educated does not mean they are too good to help someone out for one day and an hour for free.They're not more important or precious than everyone else in society that they can't do something good to help someone without expecting money. And yes I do understand the point, that the government will be saving money and making money too, and yes our present Government it known for being quite greedy, but the truth is it shouldn't be all about the money. Jeesum Peetums, the mentality that so many people in this country and around the world have adopted these days is pitiful and so damn selfish. It's always MONEY MONEY MONEY MONEY,ME ME ME, MONEY MONEY MONEY! Frickin pieces of paper and metal with numbers, signatures and a face on it, that can always be replaced is what so many people in the world are willing to give up Kindness,understanding, helpfullness for,and even kill for it. No one wants to help eachother out anymore out of kindness and understanding without money or with out having to spare a little bit of their time to do it.OH NO,I have to provide 25 hours a year to help someone for free? I mean its only 1 day and 1 hour but I don't want to help anyone for that little bit of time for free. My goodness my life is ruined!! How am I going to afford my monthly payments for my Porsche,Audi or Mercedes, or my mortgage in my lavish house or condo, and my happy hours at Abacus and Karoo on Fridays, the get togethers at Luca, Blue Cilantro, or the Ritz restaurants? My retail therapy at Camana bay to buy $345 shoes or my trips to Miami or anywhere to shop at Nordstrom and all the high end stores. Oh shoot,and that boat and waverunner I wanted to buy to have parked outside. I probably won't use it much but I just have to have it, just in case.Ughh! Light a fire under your hearts and warm it up again please!! They're getting too cold. Stop complaining! Its only a "little" slavery. Why in the world would any expat WANT to help the Caymanian Government save any more money that they will just lose to dumb, uneducated decisions made by a 5th grader? If Caymanians would just stop throwing away the 200 million a year fun fund they would have enough to pay their own bills and have enough left over to pay some one with some brains to figure out what to do with their own garbage other than stack it on top of the Mountain. What next, accoutants putting in 25 free hours to get the governemtn accounts up to date, and let the governments employees sitting on their hands as usual? An government lawyers as exempt? why? because they wrote the law? what is the rational there? Great idea, but before you put anything more into writing get it checked over by an English teacher or lay off the port! What's next – We need a change.Lord help us to live to see 2013. I think that all travel agencies should have to pay for 1 politician to travel whereever they want once a month or pay a $2500 fine and we should also require all persons having domestics to contribute 25 hours a year to clean the Premier's house and yard and the private houses of all the government MLAs so that the other tax payers don't have to, and then we should have the dentists provide 25 hours of free dental services to politicians…..makes about as much sense. This is just a little spike targeted towards Alden and a heavy heal at Chuckie following his new admission. . .
Lawyers in Cayman should generally be ashamed of themselves. The ones from abroad are equally as ridiculous as the ones from Cayman. Pro bono work is supposed to be a part of the profession, and a way of giving back. It is something that every lawyer learns about, is trained with, and is expected to do. Any one who is unwilling to do any pro bono work, or fights a reasonable stipend to help someone else doing it, is a leech on this community and deserves to be disbarred. A church takes tithes to use to serve its community. Lawyers should do no less. Lovey, most expat lawyers are corporate lawyers, they know nothing about criminal law, so couldn;t help even if they wanted to. Wise up. Lovey. Pro bono isn’t just criminal law, it’s also civil – including corporate work. And all lawyers are qualified to attend court – maybe not to conduct a full trial, but all lawyers should have been trained enough to do the preliminary matters. Or did you miss that part of first year? If you can’t do it, then pay the fee. Simple. I hope that legal aid recipients enjoy their new hedge fund/private equity fund/unit trust/CDO issuer/JV vehicle while in prison! Cant we get free health care next? Great I go out there and commit a crime and know I will have to get legal aid and dont need to pay. I feel so encouraged and confident now to get rid a few persons and get away with it. How you lawyers liking Mac now? hahahahha. = $47,000 in fees to government per year. Assume each lawyer does legal aid work: The new Daft Bill also prevents them receiving more than $65,000 (up to 4 years' experience) to $80,000 (over 10 years') in fees per year. Add costs of professional insurance, office rental, IT, secretarial and support staff, legal books and research facilities, etc etc. Then our firm of 6 young lawyers should be able to go bust pretty easily within the first few months. Alternatively, they will all refuse to do legal aid work. This is probably superficially attractive for whoever drafted this idiotic new bill (maybe they can move to the brilliant McField defence service plan (BTW where's the report on that?)) but I suspect they may find it more expensive in the long run. I am waiting to read something from the PPM Government on supporting this. Mr Alden, Mr Charles Clifford. ets hear your say on this matter. The PPM Government? There has been no such thing since 2009. A little more than a udp Government since 2001! the most ludicrous and ill thought piece of legislation this govenment has come up with to date. you know what would be funny? a load of transactional lawyers clocking in to rep clients charged with serious crimes. how many lawyers are there on this island who have enough experience in this area to make this anything but government enforced negligence? I bet Mac got his advice on this from guess who…..the pioneer of good ol'Caymanian common sense. Absolutely agree. It will be interesting to hear the opinions of the Chief Justice and Attorney General – I can’t believe that either has endorsed the proposal. Never realised how many lawyers read CNS! Should we make our cheques out to Windsor Development? This has nothing to do with increasing the number of attorneys available to legal aid defendants. The government knows full well that the vast majority of attorneys on Island do not have the experience to perform legal aid work. This is all about raising revenue to meet the legal aid bill. I don't have a problem with the objective, but it's foolish to try to address it through legislation which breaches Article 4 of the European Convention on Human Rights, pursuant to which a person cannot be required to perform forced or compulsory labour. Is it still considered "forced and compulsory labour" if the attorney opts to just pony up the $2,500 cash instead? That's not forced and compulsory labour at all. You can choose to be unemployed or work for another employer and no one will fine you. The attorney isn't opting to do anything. The $250 is a fine for an offence he has committed if he fails to perform the compulsory labour. Just more taxation without representation. A way for Caymanian government to provide a paid service to the people without haveing to actually pay for it. They all need to save that money for their own court cost and vote building, sorry, church building, sorry, nation building,church votes get out of jail free passes. I'm sure forcing private lawyers to do their work for free is an exceptable alternative to good governance here in the Cayman islands. Next up free dinners at the resturants and of course free gastric by passes for all leadership. Good point. All Doctors should be required to perform gastic bypasses and deliver babies! I'm sure my dermatologist can study it on Youtube. No representation? Are you saying no lawyers are Caymanian, or is that just your fantasy? Are you saying as long as one of them is a Caymanian that takes care of the representaion for the rest? Lawyers to work for free? Yeah, right – when a very hot place freezes over solid!! $2,500 is hardly even lunch money to one of these hot-shots! This is just another way for Government to tax the legal profession so Mad Mac can "keep-right-on-a-travelin'." Or maybe it's to start his legal defense fund? Now I know it is only the Devil worshippers will kick against this bill.But you should be grateful you have a government that works 10 and 14 hours a day, otherwise you would not even have a job. So stop complaining and encourage the lawyers to work for free. As a small contractor I do not work for lawyers anymore, its easer to get your money from the government than working for lawyers. I agree, but Mad Mac been going to Honduras often lately, I guess you right about him keep on travelling, because that is what he been doing from 2009, I guess he be doing it straight until 2013, when the people of Cayman vote him out, and then he would the lose all of his travelling benefits. When it comes to Lawyers, only in his dreams they would work for free, and in reality, they wont, it just another Pie in the Sky idea from the Mac. good way to get a fair trial with a free lawyer…. lol…. Sounds like a tax to me. If this becomes law payment of it will become an additional benefit firms will have to pay to attract anyone to work here. Never failing to hit people where it hurts Mac. So much for being 'questionable but we can forgive that because he's business friendly'! Force educated lawyers to work for free or be "fined", don't they deserve to be paid just like the rest of us for our work? Of course, what an idiotic idea! I'm not a lawyer BTW. This is Governments way of getting away with not paying for legal aid for those who can't afford it. I agree with 8:49, I suppose the Government already "taxes" the law firms heavily for T&B licenses, work permits etc. I can't believe I'm actually disgusted enough to come to a lawyers defense! As an attorney, I have to say the fee is too low and the most expensive law firms who can easily afford to pay much more will simply pay the 2500. The fee should be at least 25 times half an attorney’s average hourly rate and 25 times the full rate for those with a work permit. I doubt that you are an attorney. Why is the need for legal representation for the indigent a lawyers problem? It is society's problem and it is society at large that should bear the burden. This is a form of taxation directed against one profession when there are many others who make millions in these Islands and contribute nothing: E.g. realtors, accountants, bankers etc. Are they providing free banking, accountancy services etc. This is ridiculous. Actually this seems a good idea. Only the opt out (payment to Legal Aid Budget) should likely be double. Sweet, with a billing rate of $500 per hour, I'll just pay the piper and keep it movin. I don't even practice ciminial law. Everyone who comes here as a lawyer wants a free lunch, without no contribution. Time it is stopped. Please tell me where some of you get this idea that lawyers some how owe society something. Let's be very clear, lawyers spent alot of time, effort, and money to get their degree. Rarely are they supported by anyone but themselves or their own. The lawyers I know often quietly work pro bono, get involved in community initiatives, all the while working extremely hard to support their families and to look out for their clients. Then they are the same ones ignorant people who did and understand very little of what they have to go through who are accussed of being selfish, egotistical thieves. Everyone pointing fingers would be much better off 'contributing' themselves- maybe then there wouldn't be so much for the lawyers to come clean up and 'lunch' off of. It is called a professional obligation. You remember, those quaint old stories about law being a profession rather than a business. Well if you are going to use that line then it is not the only profession, is it? Why are the others exempt from this tax? Yes, as a practitioner of the world's oldest prefession, I never give it away for free. And government better not want any free samples either! They know that. This is all about raising revenue. They have already counted the number of lawyers with practising certificates and multiplied it by $2,500. Great, can't wait to be facing prison with a structured finance lawyer to help out with the cross examination of the witnesses! So true! another dumb idea from our so called intelligent. How scary is this! I think this is a very good decision. Come on guys think of the money that is made by Lawyers on the Island. They are not even Caymanians. How can they be against giving 25 hours a year or paying 2,500 fee. Very good. Pay up or sign up.!! Lawyers are not the only ones to make money here. Some realtors make $750,000 for unspecified consultancy services. Here's my comment for the Law Reform Commission: youve all lost the plot!! Stop being used for others political ambition and get on with the job you should be doing! Muppets! i have no intention of writing a check and i shall be turning up to court with my extensive corporate training – should be funny! This is NOT a Law Reform Bill but a government Bill. See the Final Report of the Commission on the issue of pro bono work published in 2008 on the government and LRC websites. Read first and comment next. Article said to send your comments to the Law Reform Commission. They now have my comments thanks very much! 'So glad to hear that! I was going to hold up a patty stand this weekend with a fake gun, but instead, I think I'll form a corporation. Then my corporation will steal some sensitive procurement information from my present employer, and sell it to a competitor. Having corporate and financial stucture lawyers for Legal Aid has opened up whole new possibilities for my future career! 'Talk soon! I'm sure lawyers who feel they are unable to serve their clients will pay the annual fee. On that basis should we make everyone on island who doesn't have the requisite legal experience pay $2,500? If your position is that lawyers can afford it (as a lot of people seem to be saying) then admit that you want to introduce income tax and be done with it. Most structured finance lawyers I know do not even do a very good job of filling in the blanks on their structured finance deals! It is simply a tax on the legal profession. The government should call it by its proper name. And will the doctors working 25 hours free? Can I go to a bar and get 25 hours of free drinks a year? Has anyone in government considered what it already costs to get a T&B licence for a law firm? Wouldn't that be nice..but let's face $2500 per annum for not having to do pro-bono work. 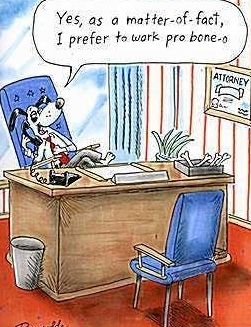 that's peanuts to most of the lawfirms! They will just pay it and have their lawyers earn a minimum of $600 per hour doing other work. It is an easy and inexpensive out for most of the law firms and in my opinion in should be higher if they decide to opt out. sure i'll do 25 hours, i'm a dive master, I watch law and order all the time, I'm sure I could get you out of jail.. It was about time the lawyers were taught that being a “profession” created obligations. See where insisting you are noble and honourable profession gets you? Should have met your obligations all along but you refused so dat wha you get! SO what about the "obligations" of the other professions? Lawyers have been the only ones supporting legal aid up until now. Forced labour is not a legitimate obligation. Doctors already give hundreds of hours for free. It is about time most lawyers did something for society rather than just themselves. I suppose it never crossed your mind that lawyers might already be doing hundreds of hours free work per year? Yes, local ones do – but those teams of structured finance and funds lawyers – you know, the kind on work permits or recent status recipients, subject to some exceptions, what do they do? Lawyers are the only profession that currently support legal aid. They give free legal advice and assistance to charities all the time. Doctors are no saints. They charge you $100 and see you for 5 mins although you have waited for 1/2 hour. But what about realtors and accountants? Is it because the premier is a realtor and his chief advisor an accountant. I will be calling their bluff and contributing my time on areas of the law that i know nothing about. We’ll see who suffers. “calling their bluff” as you put it, is professional misconduct. Go for it! That would be fun to watch. This is Cayman . Professional misconduct is just good governance here. No, its not. It would be complying with my legal obligation if this draft bill passes. Remember it is compulsory. I'm sure whatever is charged doesn't amount to even 10% of their annual income. Lets say Maples pays $500,000 for a license – do you really think Maples' income is $5 Million? Now I know all you devil worshippers will blame this bill on Mac. But if it was not for his tireless work, every day 10 and 12 hours, and similar long hours from the cabinet Ministers, especially, the Deputy Premier, most of you devil morshippers would not have a job. So please give Mac and the UDP a break. Steve McField is not complaining and for years he has worked more than 25 hours a month for free. Lawyer or not it is a sensible person. Seems like there will be a pile of donations! I don't know any lawyers that would bill out for as little as $100/hr! Even my high school educated boat jockey bills out at $65! Now the government is going to make lawyers work for for free??? Who's next? You and I? In the future will everyone be required to work a week or so for the government with no pay. R U Kidden.? I told you so. People need to stop milking this Island for free. I told you so these things would come to past, but every one continues to be mean and fight, fight every day, critize, critize and step on the people of the Island. I know this was going to happen. More is going to come too. I told you all to try and get along. If you do not try and get along what do you think will happen. Slowly the natives will want their Island back. I am an expatriate, and I love the native people. They have always been good to me for my 28 years living on this Island. My grand children go to school with the natives of Cayman and they are much happier after I moved them from private. I am a happy expatriate and I encourage everyone to try and get along. Remember we are only on this earch for a short time. We came with nothing, and we will leave with nothing. Dear Lord help us. Lawyers to work for free? Are we encouraging more crimes? What next? It's true, and I was going to say the same thing (honest) but had to check how to spell 'oxymoron', but you didn't bother, I see! Still, you're spot on. $2500 (a year) is little amount to pay to get rid of doing pro-bono work. Some lawyers make more than that in an hour. Why wouldn't they pay it? The law firms are laughing! What an easy way to get out of help those done on their luck in society. Watch and see it will be the few small Caymanian firms that will do all the pro-bono work. I see socialism is alive and well! how else can we redistribute wealth to the one out of six that have never had a job?!!! I know, maybe they can get into realestate. Looks like the commissions that you can earn to convince a man to sell his property is much more than any profession i know of (any legitimate profession anyway)! Yes I would have to agree, the real estate commissions are off the chart here and make legal fees seem reasonable by comparison. Of the two, I'd say realtors are the bigger bunch of scoundrels definitely. You might do well to remember that there are a few small Cayman firms including the sole practioners that cannot afford to do pro bono work let alone write a taxation cheque of US$2,500 per annum! Again in casting this net for the likes of Maples and Walkers, you all forget there are indeed Caymanians who are lawyers in the market not working with those firms who will be badly affected if this goes through and would like to use that money to pay their CUC and water bills and help to put their kids through school . Shameful! Finally the voice of reason! I hope the powers that be are reading this and taking note, as the only ones to be negatively affected by this are the local sole practitioners! Although, as some of us are already providing free services – we may as well get credit for it -not that we are seeking credit, but we may as well claim it and call it a day! There is no lawyer in Cayman earning anything like $2,500 an hour, and precious few anywhere in the world. I look forward to being able to claim my free food from Fosters, my free petrol from Esso, and my free beers from Royal Palms. The reason relatively few lawyers provide legal aid work is that there are very few lawyers on the island qualified to do criminal work. It also doesn't help that the rates paid for legal aid are vanishingly low. There is however a great deal of pro bono work done on the island, but not particularly well publicised. Which xxxxxxcame up with this. Is the Premier giving back some of his real estate commission. Now that where the money is. He should as most of the work was done during government working hours! Lawyers have their bills to pay and their children to raise like the rest of us. Mac is taking food out of our kids mouth to keep the criminals out of jail to harass and rob us more than they are doing now! The 3 mask men who have done multiple robberies should be taxed and comanded to pay the legal aid shortfall! NOT TODAY BO BO most lawyers at small firms are struggling to make a living and make ends meet just like the rest of us. I say Mac should give the $750,000.00 commission and all other comissions made towards the pro bono shortfall, after all he made the deal while on government watch during working hours. He is being paid a huge salary with our tax payers money and also collecting huge commissions on the side, we also pay for his first class travel and hotel accommodation . Donate ill eranings and spend less Mr.Premier and help our CI get back in BLACK!